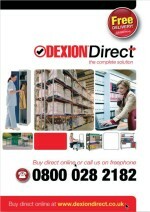 Established in 1972, Brysdales Ltd is one of the UK’s Leading Dexion Storage Centres. Based in Chorley, we operate from our own wholly owned, purpose built 9,000 square foot office and warehouse facility – supplying to customers both nationally and throughout the North West. We specialise in maximising space – YOUR SPACE – saving YOU TIME and MONEY. We design storage solutions utilising the market leaders in both Shelving and Racking products for every part of your business – whether it's an office or warehouse, production facility, school or hospital and whatever the environment – ambient, cold or chill stores. Dexion are best known for their Industrial Racking Solutions, however, they also offer a wide range of products to suit every need including Industrial and Archive shelving. To complement the Dexion Industrial product range we also offer the Bruynzeel range of Commercial Office shelving including both hand cranked and electronic Mobile shelving solutions. We supply a range of fully demountable and re-locatable partitioning systems to create all types of office space – from Board Room to Trade Counter offices – we have a solution to suit every budget. We design, supply and install Mezzanine Floors – utilising the space in the height of your building. We liaise on your behalf with the Local Authorities and Fire Officers to ensure compliance with statutory legislation. We offer a range of bespoke products including Benches, Lockers, Cupboards and Trolleys. Our organisation includes a complete in-house design, technical and installation service capable of handling the most complex contract or small orders from our extensive stocks. Brysdales have the experience and the expertise!